I used this wonderful random stripes generator at Biscuits and Jam to plan the stripes. Mostly Loops and Threads Impeccable yarn, except for the medium purple which is yarn that I have had stashed for a very long time (so long I didn’t know I had it until I organized my stash!) waiting to be made into something. 3 skeins Purple – old Wintuk yarn, that I don’t know how (or when) I got, but goes with the other colors perfectly! When I was determining how large to make this I just went ahead and crocheted a long chain and then checked to see how long it was against my bed. I made the chain about 12″ longer than I wanted the blanket to be. 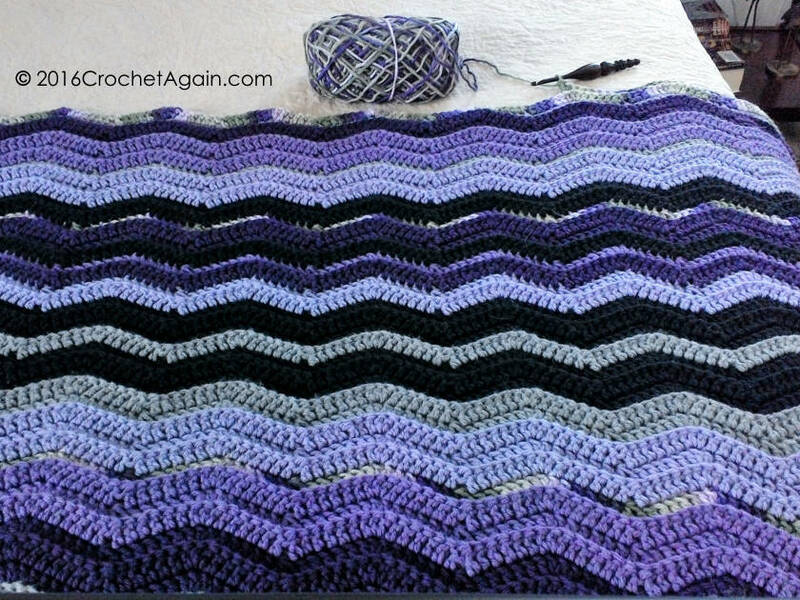 Then I made the first row of dc in the ripple pattern (as in Row 1 directions below) and checked that on the bed for size. When the first dc row was about the length I wanted, I finished the row (as in the directions below) leaving the extra chains there for the moment. I made sure to double check that I hadn’t made any mistakes in my crochet, no missed or extra stitches anywhere, as this is the foundation I will be building on and it needs it to be right! Once sure all was well, I undid all the extra chains that were left from the beginning and voila, perfect length with no counting and calculating! 2dc in 5th ch from hook. dc in next 2 ch’s. 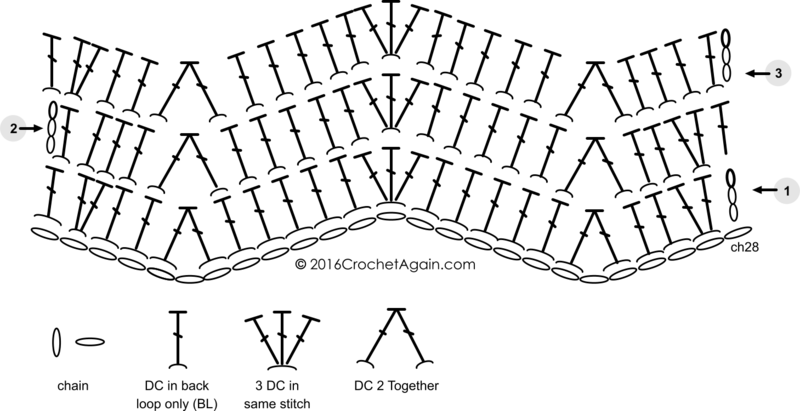 [dc2tog – (this goes across 3 chs) in next ch, yo, pull up a loop, yo & pull through 2 loops, skip a ch, in next ch yo, pull up a loop, yo and pull through 2 loops (3 loops on hook), yo and pull through all 3. One dc2tog “valley” made. When you are near the end and have done the last valley, you should have 4 ch’s remaining. Dc in the next 2, 2dc in the 2nd to last, dc in the last. Go along like that across until you reach the last 2 sts (the turning ch3 of the previous rows counts as the last stitch). 2dc in the 2nd to last st (to increase 1 st at end of row), dc in the top ch of the turning ch3. 5 stitches before the end of the row, hold the new color along the top of the previous row (leaving a generous tail for weaving in), and crochet over it as you do the last 4 stitches. In the last stitch, make your dc up to the last yo, pick up the new color to do the last yo, and pull through the last 2 loops on your hook. . Ch3 and continue on with the new color, leaving a long tail of the old color to weave in. There’s nothing quite like the flow of a ripple design! Thank you for sharing how you do yours and how to contend with those pesky colour joins! Oh wow! You did so much of the work already for us!!! Thank you!!! 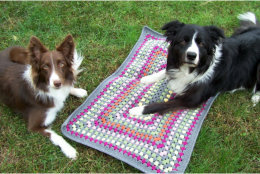 I want to make my adult kids and the 1 teen Afghans for Christmas and was thinking ripple stitch. 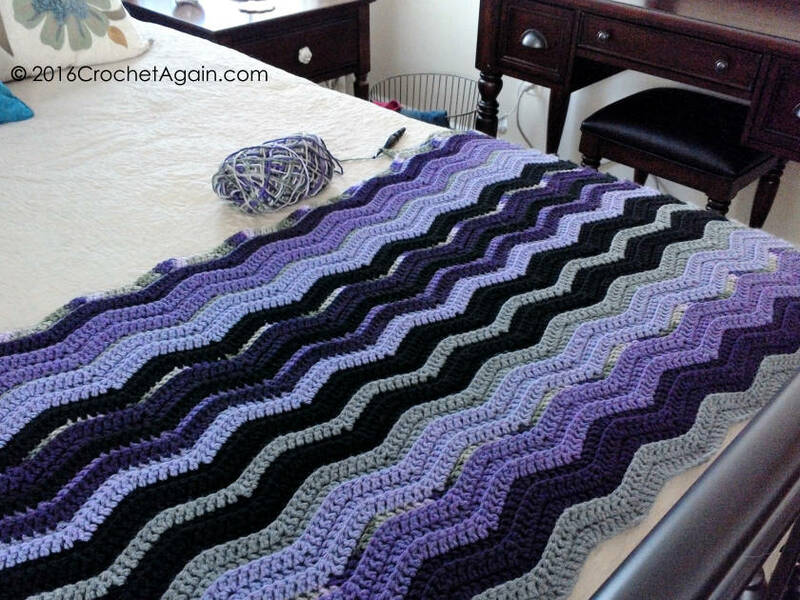 And here you pop up in my email with this lovely purple blanket in ripple stitch and all the planning done for me! Thank you!!!! Thank you!!! And in 5 minutes it will be my 55th birthday. What a great gift you’ve given me!